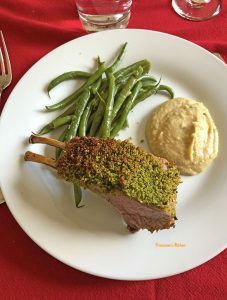 If you are looking for an easy and tasty recipe for Easter or any special occasion, I recommend trying my delicious French Herb-Crusted Rack of Lamb. This dish is much easier to make than it seems. 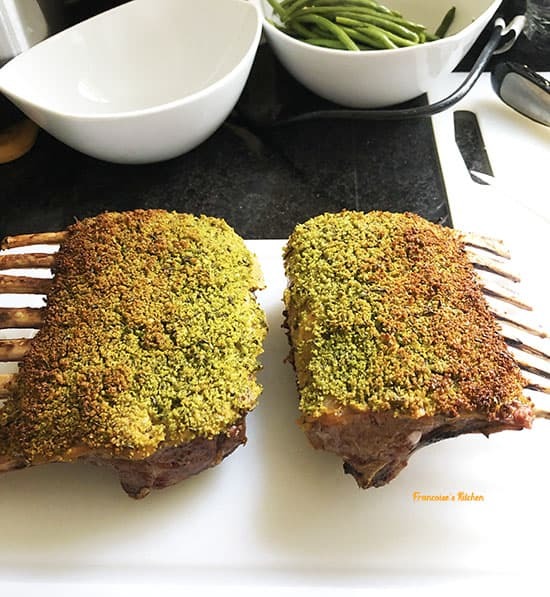 Believe me, your guests will be impressed when you put this Herb-Crusted Rack of Lamb on the table. Smoothly Mashed Butter Beans, with a hint of lemon, go wonderfully with the lamb and enhance its flavor. It can be served on the side or spread on the plate under the lamb. You will find the recipe below. I like to add some green vegetables to my plate such as green, but asparagus, spinach, or your favorite vegetable will be great too. Pulse all ingredients into a food processor until everything is finely chopped and well-combined. Season all sides of the lamb with salt and pepper. Heat a frying pan (ovenproof) with olive oil until hot. Add the racks of lamb (start with fatty side first) and brown on each side (1-2 min. by side until brown). Transfer the racks of lamb on a baking sheet, bones down. Let cool a little bit then generously brush each fatty side of the lamb with the mustard. 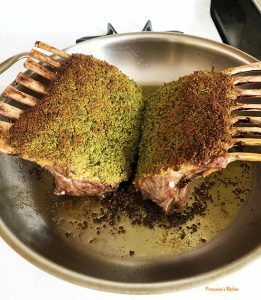 Divide the herb crust in two, coating each rack with herb crust. Gently press to adhere herb crust over the mustard. Put the two racks back in the frying pan (fatty side up), drizzling a bit more oil if you want. Roast in the oven for 20-25 min. or until a thermometer inserted in the thickest part of lamb registers 130°F for medium rare. Let lamb rest at least for 10 minutes before slicing into chops. Cover with aluminum. Transfer the meat on cutting board. Cut into chops and serve. While the lamb is cooking, in a food processor, add the butter beans, garlic, anchovies, rosemary, lemon juice, and olive oil. Pulse until smooth. Gently heat in a saucepan when the lamb rest.